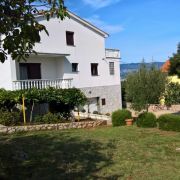 Two apartments in the attic of the house in the quiet resort Risika on the island Krk. One apartment for 4 persons … More » , one apartment for 3 persons. Both apartments have separate terraces with sea views. The database contains direct contacts to owners of accommodation in Risika. Reservations are passed without any middleman and commission!